As I presented in my post about becoming Admiral of the High North, I have a goal of paying an annual ‘tax’ to the Crown in the form of largesse, practical items that the Crown can use or regift as they see fit. This year I held true to my theme of Norwegian artifact-based projects, and created a score of leather coin purses, based on a find from Medieval Bryggen in Bergen, Norway. I first came in contact with this particular coin purse through Katafalk’s (Cathrin Åhlén) tutorial. Her inspiration came from Max Lundquist’s blog, where there is a photo of the original artefact from a display at the Bryggen Museum. I started playing with the design, experimenting with two cloth prototypes, then was later gifted an example of this pouch in the first Drachenwald A&S Exchange. When I was considering what to make for my ‘tax’, I revisited Katafalk’s blog and found a link to Fortidsfamilien, a Norwegian couple who are also exploring history through hands-on projects. They too have blogged about this coin purse, sharing an additional two pictures of the original. I produced my first two trial coin purses in cloth. I wanted to play with materials, sizing and finishing without wasting expensive leather. 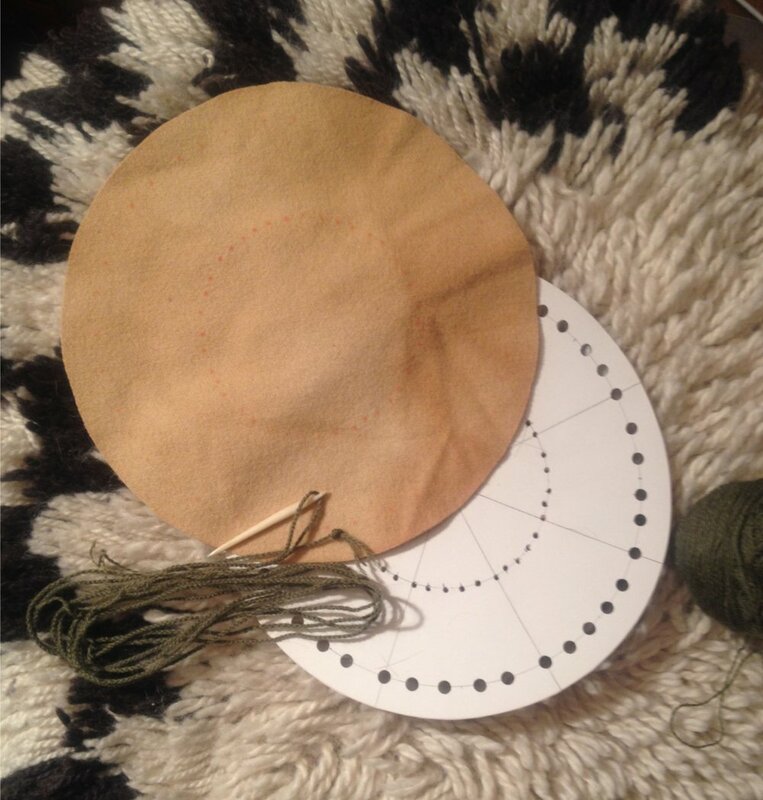 The larger attempt was made in a plant-dyed (onion, very uneven) light brown wadmal, measuring 22 cm in diameter. The second was made of a much lighter weight tabby in green plaid, 19 cm in diameter. The cloth was marked through the cardboard stencil with tailor's chalk. I made 4 strand whip cord of Rauma Brodér yarn, a very sturdy fiber that should withstand rough use. There are a few finds of both cloth and leather pouches from London (Crowfoot et al. 2001; Egan & Pritchard 2002) , though none of these has the inner row of lacing present in the Bergen find. I was curious about the treatment of the holes for lacing the drawstring on the cloth pouches, if there was any reinforcement such as eyelets. I could not see any such evidence on the photos, nor was there any mention of eyelets in the accompanying text. This is not proof that there was none, but it did make me curious as to how lacing holes without reinforcement functioned. On the two cloth prototypes, I opened up the holes for lacing with a bone needle, attempting to avoid breaking the threads in the cloth. The wadmal was resistant, as was expected, but the plaid yielded nicely making lacing simple. The eyelets closed around the inner row of lacing, making the supportive laced ring very stable. 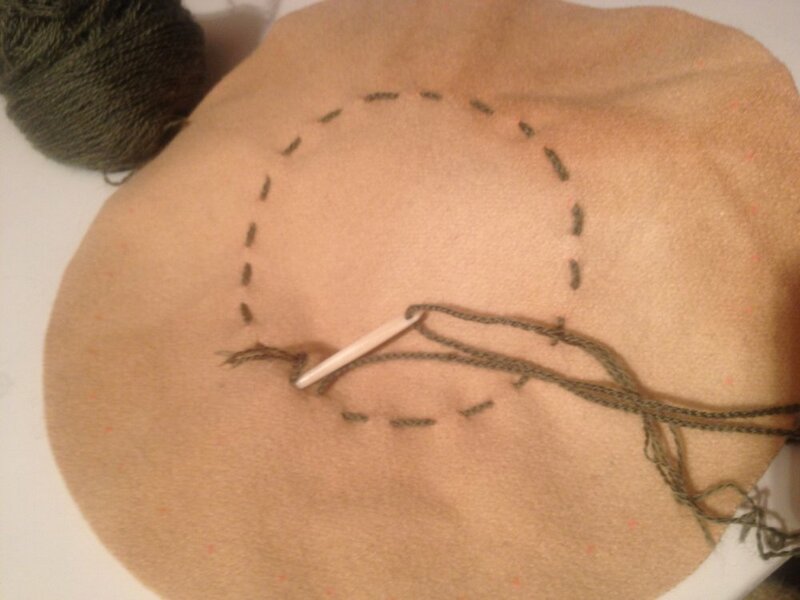 I was also concerned about fraying around the edge of the cloth, so I whip-stitched whip cord to the outer edge. These little coin purses have worked satisfactorily. The wadmal is a bit stiff, and the pleats have not developed well. I have used it for my jewelry at Double Wars, and the pleats were a great place to keep my veil pins readily accessible. The plaid pouch has been given a harsher trial. I filled it with all of my medieval coins and hung it from my belt whenever I was home over the course of a month, opening and closing it a few times every day. The pouch shows no wear, it opens and closes easily, and has remained closed when hanging without any additional knotting of the drawstring. The whipstiched edging has not pulled out and there is no fraying. Interestingly, the holes for the drawstring lacing show no wear. This may relate to the fact that the warp and weft of the cloth were not damaged as the lacing passed through the cloth making eyelets superfluous. Do we have a tendency to over-engineer techniques? Could this relate to our expectations for performance influenced by modern materials and techniques? I look forward to revisiting this at a later date. I used the larger template to make a trial coin purse in vegetable tanned sheepskin. I marked the hole placement with a soft graphite pencil. Fortidsfamilien mentions punching the holes with a chisel as being more efficient and historically correct than Katafalk’s choice of hole punch. The illustrations in Egan & Pritchard (2002, pp. 344-346) might well support this assertion, and other sources could be pursued for further corroboration. I don’t own an appropriate chisel, so I opted for Katafalk’s choice of hole punch. More precisely, I used a hole punch for the outer rounds of holes for the drawstring. I punched holes for the inner round of lacing with a simple awl, thinking that the smaller holes would help prevent the lacing from shifting. I also chose whipcord (4 strands of 2-ply Rauma Prydvevgarn of Spælsau) as a colorful option for the lacing, rather than the original leather– approximately 80 cm for the drawstring and about the same for the inner lacing. So far, so good. Time for making 20. I first produced 32 meters of whip cord in natural black, red and plant-dyed golden yellow (onion). I then cut 25 rounds out of three vegetable-tanned sheepskins, attempting to avoid blemishes and thin patches. Next up, 1600 holes to punch– 40 awl holes and 40 punched holes per coin purse. Repetition in numbers forces an understanding of efficiency of process; The awl holes worked well, but the modern hole punch was exhausting and I longed for a Medieval chisel or punching die after the first few rounds! I took the rounds, whip cord and tools with me to Double Wars for space efficiency. I then assembled them on site during the course of the next few days. Nearly all of the whip cord was used in the end. 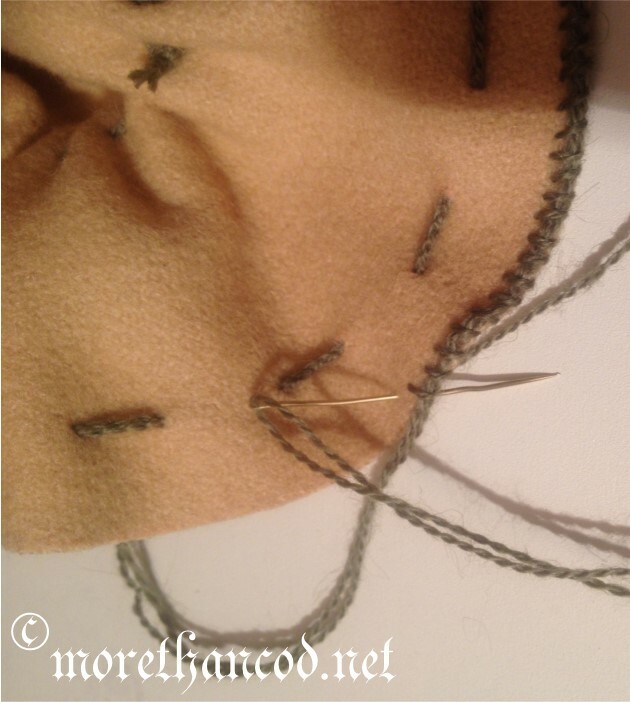 Frustratingly, I discovered some surface flaws on a couple of the coin purses as I laced them. Thank goodness for having remembered to take spare rounds! I was also reminded about the variance of leather within the same skin. Some of the rounds were marginally stiffer than others, the former probably from higher on the back, while the more supple rounds from side and belly. This made a difference in how the folds formed when the drawstrings were pulled closed, though not enough to affect function. I believe the leather will become more supple with use. I enjoyed working with these purses. The initial experimentation has given me some insight into techniques that may prove relevant to other projects down the road. I have also been given a reminder on the value of repetition. Doing one process many times helps in learning efficiency. I hope the end recipients of these coin purses find them useful. Crowfoot, Elisabeth, Frances Pritchard, and Kay Staniland. Textiles and Clothing: c. 1150-c. 1450. Medieval Finds from Excavations in London: 4. London: The Boydell Press, 2001. ISBN: 1-84383-239-9. p. 164. Egan, Geoff and Frances Pritchard. Dress Accessories 1150-1450. Woodbridge: Boydell Press, 2002. ISBN: 9-781-84383-351. pp. 342-350.